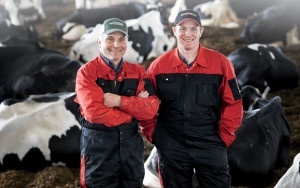 Richard Banks with www.myfarmlife.com, wrote about Todd and Murray Schnarr of Alma, Ontario, who have converted to Lely automatic milking systems in order to save on labor costs. Read an excerpt of the article below or the entire article and video here. The exchange got both Todd and his dad, Murray, talking about things they’d been thinking for some time. To survive in the dairy business, they knew they needed to make adjustments. Not that they were strangers to change, however. For instance, slightly more than a decade before, Murray had asked his son to join the business, and the two Schnarrs doubled the size of their dairy to accommodate 98 cows. But the changes the two dairymen began to discuss this time around were more revolutionary than evolutionary. More transformational than just a revision of the current model. After attending an open house at a neighboring dairy, the Schnarrs found what they hoped would be a solution consisting of two main parts, each working hand in hand with the other. One was a compost-pack barn that would give the cows the freedom to move about inside, which, in turn, would allow them to essentially milk themselves at the second part of this equation: a robotic milking system. Pioneered in Europe some 20 years ago, significant numbers of dairies in Canada, and more recently the U.S., have begun installing robotics, also referred to as automatic milking systems (AMS). At a cost under $200,000 for a basic AMS, dairy owners hope the payoff will come relatively quickly, mainly in the form of increased yields and lower labor costs. Todd Schnarr can access a vast array of data on the robotic milker’s monitor, as well as on a computer in his office and his smart phone. The robotic system the Schnarrs purchased, which includes two milkers, a central pumping and processing unit, feed pusher and calf feeder, cost them about $400,000. Even with a total cost of $1.7 million, including construction of the new compost pack barn, Murray and Todd hope the system will pay for itself in six to seven years from time of completion. The first two months in the new facility were made all the more difficult because it was the busiest time of the year for the Schnarrs’ custom hay operation. They were trying to cut and bale hay in what is typically a tight window for such work. As of this spring, the Schnarrs’ cows were up to 34 liters per day, and they expect the increases to continue, in large part because the cows can milk themselves when they’re ready, not at times set by their dairy operators. For instance, in the Schnarrs’ old barn, the cows were milked twice a day. The 115 cows in the new setup now visit the robotic milkers an average of 2.6 to 2.7 times per day. Read the complete article and video here.